So the (supposedly very good otherwise) movie about Neil Armstrong’s walk on the moon didn’t include the planting of the American flag. So, in a landmark space mission where weight is essential, mission planners decided to build a custom designed flag assembly to carry to the moon because . . . it wasn’t important? There certainly was a sentiment that the achievement was an advancement for all mankind, but the fact that Americans spent 7 years and the equivalent of $65 billion/year (2015 dollars), and that American lives were on the line when the mission was conducted, certainly suggests that some Canadian actor shouldn’t be trying to diminish the American contribution. Finally, I’m willing to buy that Neil Armstrong didn’t view himself as an ‘American hero’ because I doubt he viewed himself as a hero. But I’m pretty sure he thought of himself as an American. I had never heard of a bird called a Bobolink before. They have this weird blonde patch on the back of their heads and a very interesting shape to their beaks. I assume this guy was burping when the picture was taken. Looks like they took a breather in June. The data for July should be out within 10 days; hopefully we’ll see a resurgence of growth. Unless the Trump tariffs suppress it. 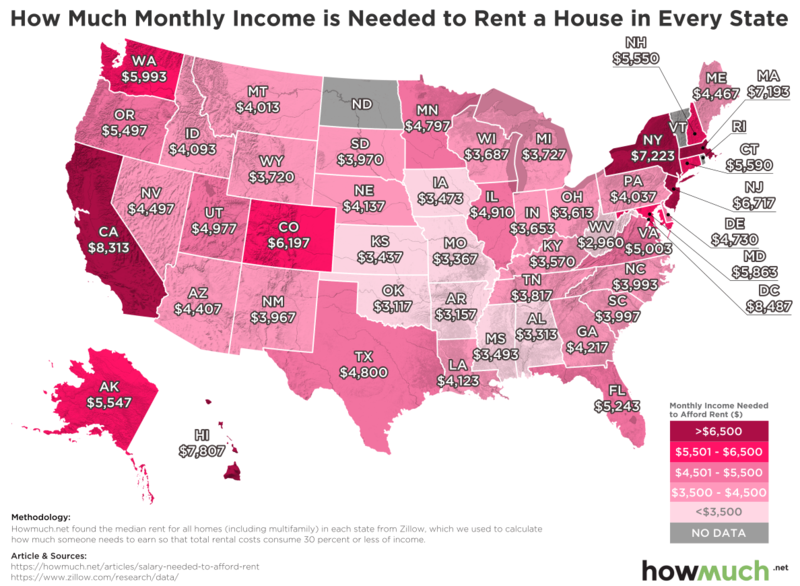 From HowMuch.net, we have a lovely little chart telling you what monthly income you’d need to rent an average unit in each state. You can see how nasty prices have gotten in my state (Colorado) due to the influx of fleeing Californians and marijuana lovers. Ran across this Costa Rican video of the devious and persistent nature of army ants. Earlier this year, Denmark’s Environmental Protection Agency published an extensive study that looked at the life cycle environmental impact of various grocery bags. What did the Danish study find? Those terrible, awful, lightweight disposable bags that Kroger plans to ban had the lowest environmental impact than any of nearly a dozen reusable alternatives it studied. In some cases, the disparity is huge. The study found, for example, that a shopper would have to reuse an organic cotton bag 2,000 times before it equaled the environmental impact of one disposable plastic bag. If that shopper went to the store twice a week, it would take them 19 years before that bag was better for the environment than the plastic bag they replaced it with. Straws, electric cars, shopping bags: it’s amazing how virtue signalling satisfies “environmentalists” desire to save the environment, without the necessity of actually saving the environment. BrewDog’s DogHouse outside of Columbus, Ohio is finally opening to the public, and will soon welcome its first guests. In addition to the in-room perks, guests will be greeted by a lobby bartender when they arrive, who’ll hand over a complimentary beer during check-in. Other on-site amenities include large common areas and a front patio to relax, ping (or, let’s be real, beer) pong tables, a media room, state of the art fitness center, and even a dog park, which is easily accessible from its four dog-friendly guest rooms. Even the personal products are beer-themed, and include a line of hop-infused soaps. It might take a while to get used to checking the beer list when you’re making hotel reservations, but I’m sure I’ll adapt. Last year I pointed out that though Iraqi civilian casualties were comparable under the Obama and Bush administrations, the press stopped talking about them as soon as Obama was elected. You may be wondering, then, why it is that they haven’t resurrected the issue now that Trump has taken office. The answer is: Based on preliminary data, Iraqi casualties have plummeted. Very nice to see, no matter who’s responsible.